Erbology`s chia seed oil is loaded with healthy fats, vitamins and antioxidants. In just one spoonful, you’ll get over 60% of omega-3 essential fatty acids. Omega-3 has been extensively studied for its support of heart activity, the nervous system and eye health. In addition, it helps nourish hair follicles and the scalp, leaving your hair looking stronger and shinier. As a dietary supplement, one tablespoon per day. Add to smoothie, porridge, dressing or yogurt. Externally, apply a small amount onto clean skin or hair. 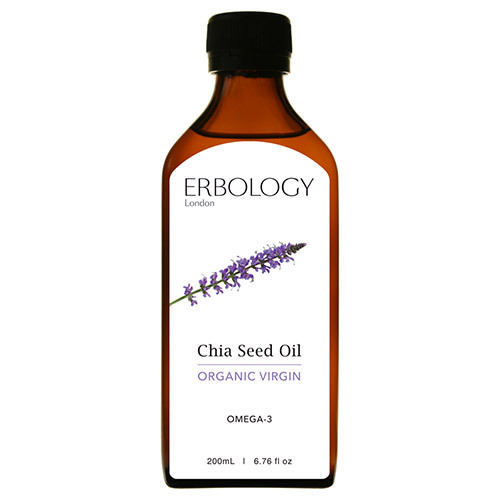 Below are reviews of Erbology Organic Virgin Chia Seed Oil - 200ml by bodykind customers. If you have tried this product we'd love to hear what you think so please leave a review.